When a restaurant boasts the name of Alan Yau behind it, one cannot help but have high expectations. Alan Yau is the man synonymous with the success of Hakkasan and Yauatcha, both Michelin star holders, and other well-known establishments such as Busaba Eathai, Wagamama and the recently-opened gorgeous Milanese bakery, Princi. Such is his Midas touch, it seems only just to have high expectations when stepping through the door of one of his restaurants. So it was that I went to dinner at Sake no Hana (Flower of Sake) last night, another Alan Yau offering, giddy with the weight of expectation. Add the money of owner Evgeny Lebedev, son of a Russian oligarch, and a location in the heart of Mayfair, and you would seemingly have a blend to induce one huge success story. But for the privilege of such a pedigree, a monied backdrop and said location, comes a price. Case in point, the beer. £9.50. Yes you read right, nine pounds and fifty pence. Ok, it was good beer, Suntory premium malt (a winner of the Grand Gold Medal at Monde Selection for Three Consecutive Years), and admittedly not a kind you might readily obtain in London. But still: £9.50? It was the same price as my cocktail, the ‘Gandara Dream’ (Kumquats, Diplomatico Reserva rum, Don Julio Silver tequila, Umeshu plum liqueur, almond sugar and green tea), which as delicious as it was, was more ice than drink. We started with a softshell crab salad with wasabi sauce (£10.50), although we had tried to start with two different scallop dishes: the prawn, scallop and lotus root katsu (£8), and the scallop and spring onion in miso mustard dressing (£8.50), only to be told that both the scallop dishes were unavailable. Huh? It was barely 7pm, and with Sake no Hana’s pricing levels and upmarket persona, this was all too disappointing. Next we were told that the oysters were also unavailable, so we finally settled on the crab, managing to secure the very last serving, and only because of the sheer ingenuity of the waitress rushing off to reserve this dish with the kitchen before she came back to take the rest of our order. 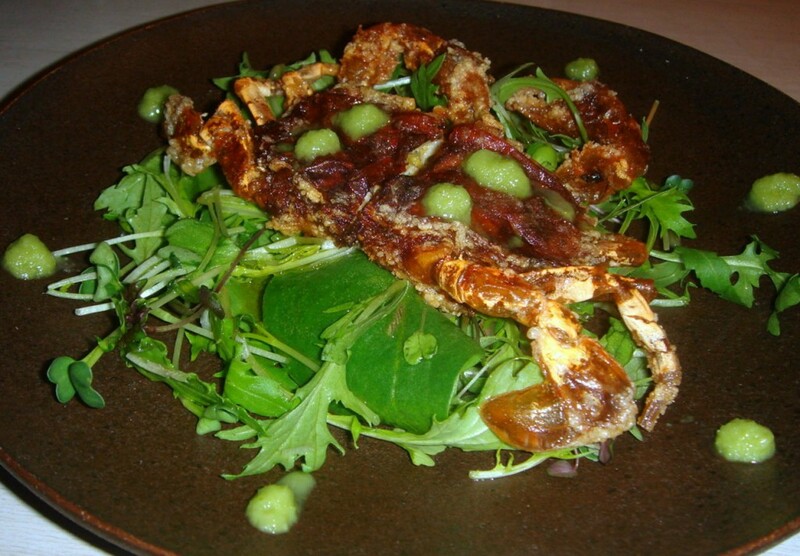 The softshell crab was delicate and sweet, with a crunchy, crisp batter that was delicious if perhaps a little heavy – heavy in a way that slightly submerged the gentle sweetness of the crab flesh. Another disappointment was that there was only one piece of the small crab. I had hoped for more. 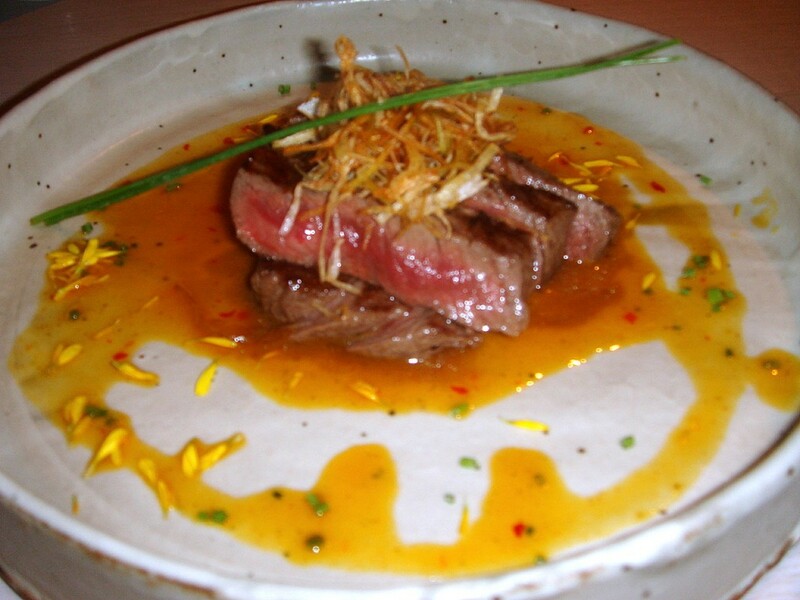 A wagyu beef came with a fragrant, delicate mustard sauce and was succulent, if chewy in parts. But it came in at a heady £45 which, although not unexpected for wagyu, seemed exceedingly pricey given the six meagre slices of beef. A dish of crabmeat wrapped with seabass and yuba (tofu skin) was simply gorgeous, although it was yet again another tiny portion given it was priced at £10.50. Flavoursome and sweet, the two different types of seafood provided a lovely textural contrast, delicate from crabmeat, firm from the seabass. It came with a gorgeous sauce made from dashi stock (Japanese soup stock) and mirin (rice wine). A dish of braised miso tuna cheek was exceedingly fishy, fishier than one would expect of fresh tuna that it could only lead me to suspect that the tuna cheek was not entirely fresh. Texturally quite meaty, the accompanying sauce was heavy and rich and the combination with the fish rendered an overwhelming aftertaste on the palate. With the added boniness of the tuna cheek where I was forced to constantly pull the bones from my mouth, the dish in summation was all rather difficult to eat. We skipped the nigiri which starts from £3 a piece and instead went for a delicious futomaki roll (£8.50) which hit the spot nicely. Filled with eel, prawn, egg and other yummy fillings, it provided a wonderful contrast of flavours, and the rice served to fill the tummy after some of the small portions we had so far thus encountered. A wonderful dessert of walnut cruistillante (crisp) (£7.50) also hit the spot nicely. It was creamy and nutty, but subtly so without being too rich or sweet. Despite my high expectations, there were just a few too many little things about Sake no Hana that niggled, notwithstanding the not-insignificant factor of its pricing and all too small portions. The food was inconsistent. 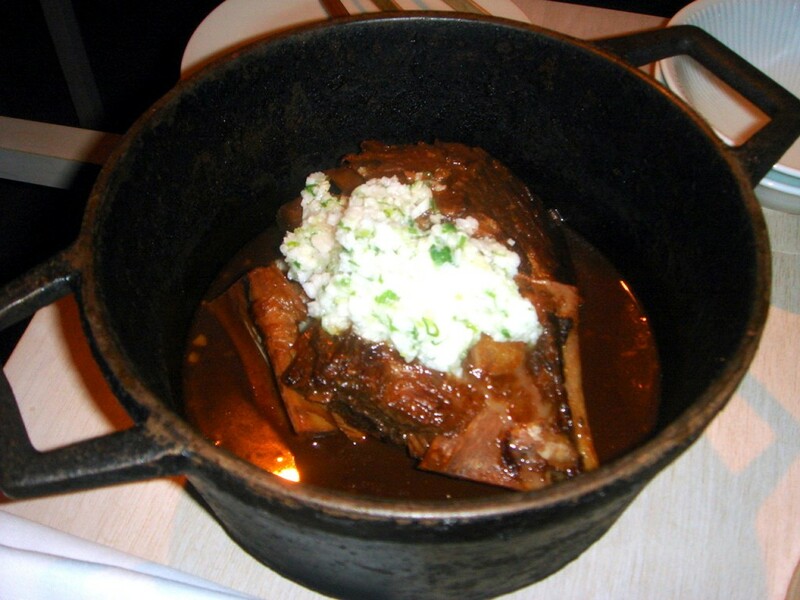 Whilst some dishes shone with intense astute flavours, some didn’t resound with success. Onto the décor which is trademark Alan Yau. Sake no Hana is slick and modern, with gorgeous high ceilings, and slim wrap-around screens that dress the windows from ceiling to floor. And merging the West with the Orient, there is also a choice of seating between the western style and the traditional Japanese arrangement of tatami mats on the floor, which at Sake no Hana have been adapted for westerners with the low tables dug into the floor so one could dangle one’s legs rather than cross them. But elegant as it may be, it is also a little sterile and uninviting. The bathroom, located two floors down in the basement, could only be accessed with a lift from the dining room on the first floor, inconvenient if you happen to have just missed the lift given that it is rather slow. Finally wine lovers might be in for a disappointment as the wine list is limited to only about a dozen choices, although there is a range of cocktails, sake and top brass champagnes to fill this void. Sake no Hana is pricey, and on this basis it was hard to be entirely forgiving about all the little niggles. But the upside is the small portions mean you can order more different dishes to try, which is perfect for those who, like me, love to sample different dishes. Approximate price bracket – £40 to £60 based on four to six dishes between two to share. Excludes drink service.